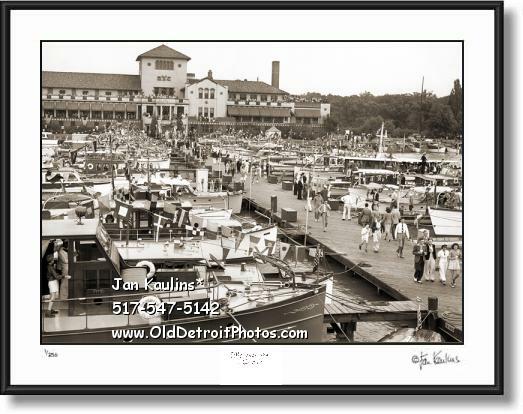 DETROIT YACHT CLUB DYC VINTAGE black and white photo print picture photograph for sale. This sepia toned black and white historic DYC photo of THE 1939 DETROIT YACHT CLUB is made from the restored original 70 year old black and white September 1939 Detroit Yacht Club DYC photo print. This is a wonderful very rare and historic vintage Detroit Yacht Club DYC view of this landmark taken during the 1939 Gold Cup Races on The Detroit River. You can see the wonderful assortment of vintage boats as well as the vintage stylish clothing of the DYC members and friends on an historic outing at the world famous Detroit Yacht Club. This is a beautiful historic DYC photo of this 1920's Mediterranean-style villa that continues to be the largest yacht club in the entire United States. It is also the twelfth oldest. The original small clubhouse was erected on Belle Isle in 1891 but was destroyed by fire in 1904. A concrete bridge, shown in this historic DYC vintage photo print photograph opened in 1923, the same year that the present structure, shown in this rare vintage Detroit Yacht Club Aerial photo print for sale, was dedicated. It was designed by architect George Mason, who also designed Detroit's Gem Theater, Masonic Temple, and the Mackinac Island Grand Hotel. This rare image was taken only a few years after that historic dedication. .